Tomato sauce is the chosen accompaniment to a lot of snacks and breakfast dishes, inlcuding samosas, sandwiches and cutlets. They are also available in many flavours and tastes. But the biggest disadvantage is that they are loaded with unhealthy ingredients like artificial colouring, preservatives and lots of salt, which are all very harmful for health. 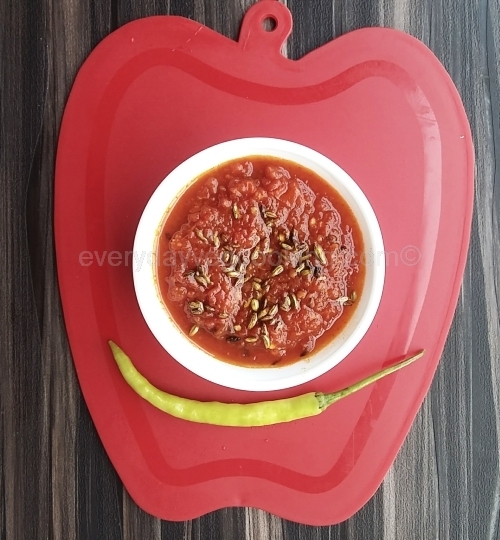 An easier and healthier alternative is the homemade khatti meethi tamatar ki chutney. It is not only very easy, but can also be prepared fresh, as it takes very little time to make it. This desi homemade tamatar ki chutney can be served with cutlets, bread pakodas, stuffed parathas. You can also serve it as dip with nachos. Remember to use fresh, red and firm tomatoes to make this chutney. 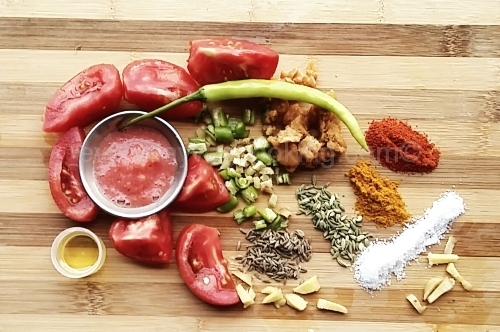 Grind tomatoes, green chilli and ginger into a smooth paste. Heat oil in a pan, add jeera and saunf. When they turn golden, add hing. Now add the tomato paste, haldi, red chilli powder and salt. Mix well. Cook on a slow flame, stirring from time to time, till the mixture thickens. Now add gud, mix well and cook for two more minutes. Switch off the flame, transfer the chutney to a serving bowl. Let it cool. Delicious khatti meethi tamatar ki chutney is ready to serve. I use saunf in many recipes it add nice flavour and enhance the taste of the dish.